We can finally reveal the good news about our new project that we’ll be carried on over the next 1,5 years in a small city called Asnæs! We’ll be transforming an empty property into a co-creative Citylab, where the local community will be a part of designing the city – with a special focus on youth. The citylab will be activated through educational workshops, exhibitions, events and city tours etc., and the process will create a common language about the physical environment. 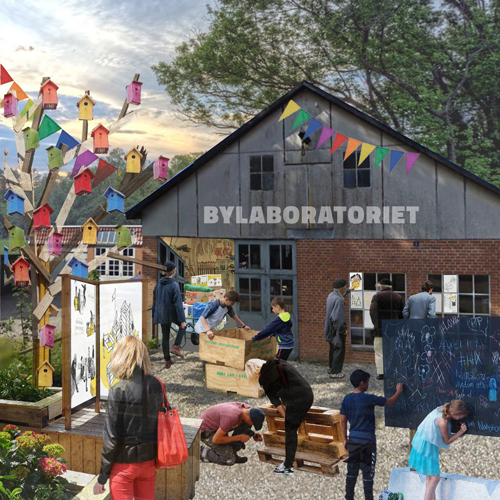 Throughout the process we’ll collect a database of local knowledge, ideas, dreams and needs, which eventually will be translated into permanent designs in the city centre in Asnæs. The project is a close collaboration with Odsherred municipality and is funded by the Danish Ministry of transport, Building and Housing Authority. The educational institutions play a crucial role in the project – especially at the beginning of the process. We’ll be involving the local high school and public school students, who take the role of the planners and study the needs and potentials of the city and come up with new design solutions. The young people will develop the city through a collaborative process and will be able to develop new concepts in their local environment. The project also supports the development plan for the city centre, that aims to strengthen Asnæs’ position as a youth- and educational city. The citylab will be a physical platform, where we’re able to test out ideas and get an understanding of citizens’ needs. Throughout the whole process we’ll have a close dialogue with active local citizens and activate the local industry, volunteer groups etc. It’s essential that we’re able to support and nourish the local community throughout the project in order to make it flourish and get a stronger sense of community. The local citizens will be invited into exhibitions in the citylab to see the ideas, and it will help spark debate and make awareness about other groups in the local community. People will be invited to give their opinions and are able to join the open labs. They are thought as a way to always keep an open dialogue throughout the whole process. To ensure that the general local community will be able to benefit from the suggested ideas the young people we’ll be interviewing local players in Asnæs. In that sense it will be ideas designed by youth, but with a focus on benefiting the entire community. Through the process the young people we’ll be involved in developing, designing, and to some extent building and setting up temporary installation around Asnæs city centre. The temporary initiatives will be used as a tool to test different solutions and to develop permanent solutions with strong local support. It will ensure that the design points towards the permanent, since we’re involved in the entire process and helps to align expectations and needs. The permanent solutions will be responding to the citizens’ shared concerns, and our task will be to translate their needs into architectural and aesthetic design. We’re so happy that we get the opportunity to work in Asnæs, a city with numerous potentials and a great local community. This project gives us the possibility to experiment and make urban design from bottom-up, where we get to follow the citizens the whole way through – from involvement to the final design. It will be a good example to show the importantce of the process not only the product! Thanks a lot to Danish Ministry of transport, Building and Housing Authority for making this great project possible. And also a big thanks to Odsherred municipality for being innovative and open-minded to new experimental ways of developing the city!